If you are a previous customer of ArizonaPoolDrain and would like to leave a review of our services on Google Local Reviews we would greatly appreciate it. 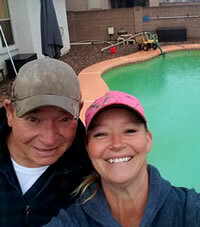 “Dear Rich, I want to thank you for the great job that you did on my pool. It had become a real problem due to tree roots crushing the piping to and from the pump and the pool. It was pretty nasty before you started, but by the time you left, the pool was empty, clean, and ready for the pipe repairs and a new lease on life. Feel free to give me a call anytime if you have concerns about your pool. Do You Have a Photo Of The Pool To Attach? Arizona Pool Drain is a full service pool draining, pool cleaning and maintenance company based out of Queen Creek and serving all of Maricopa County, AZ. We specialize in pool draining, pool cleaning, pool tile acid washing and pool maintenance services. Fast, courteous service, fair prices and our estimates are always Free!